Our goal is to provide a welcoming, nurturing Montessori environment for young children, which guides them in reaching their full potential. MVM strives to create a setting where children are valued and honored; the families feel welcome and informed; and the community is enriched by our presence. Through keen observation, a well-prepared environment, and our commitment to lifelong learning, we provide an exceptional Montessori education. We are dedicated to instilling in the children respect for the environment, honesty in relationships, and compassion for those around them. The Montessori cultural curriculum covers a wide range of subjects: geography, botany, zoology, art, science, and music. At Missoula Valley Montessori our cultural curriculum is the foundation of our academics. Each year we focus on one of the seven continents. Many aspects of the continent are then investigated from geography to cuisine. The children are eager to learn about people in far away places. They delight in discovering things they have in common with children across the world and learning different customs, too. Aspects of any given culture are woven through other areas of the curriculum. Our practical life lessons will include cooking Asian food, for example. The children will learn to count in French, to say hello in Japanese. The language shelves become rich with books, terms, and alphabets from other cultures. Famous artists from a country will be discovered and imitated. Finally, each spring the primary students put on a performance to reflect all that they have learned. In the words of Maria Montessori, "Let us give the child a vision of the whole universe...for all things are part of the universe, and are connected with each other to form one whole unity." Guest speakers will be invited to share their expertise. We will also take the children out into the community to be exposed to the vast scientific offerings in Missoula. The primary tenet in the Montessori philosophy is that all children are unique, capable individuals who are to be respected as different from adults and from one another. They all carry within themselves the adult they will one day become. Through years of research and keen scientific observation, Dr. Montessori came to profound conclusions. At MVM we adhere to these tenets: a well prepared environment with attention to sequence, order, beauty, and detail; the finest Montessori materials which instill independence, concentration, and self correction; and teachers who are keen observers, fully trained and well prepared. At MVM your child will be supported not just academically, but socially and emotionally as well. 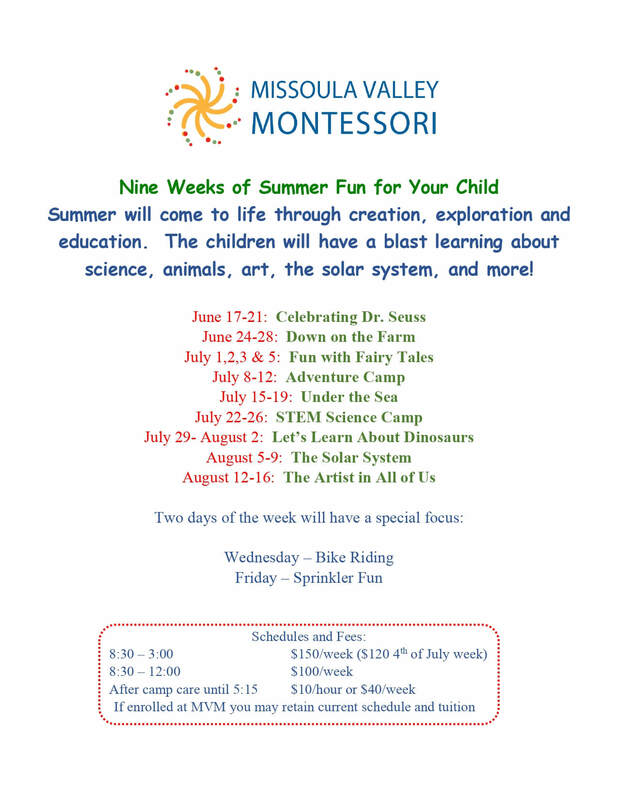 Copyright © 2019 Missoula Valley Montessori, all rights reserved.